Businesses that have launched a punchout catalog with us have found that not only do they get paid faster and maintain control over inventory, but they also retain more customers. By offering the flexibility of a punchout catalog, your customers will be happier and less likely to search out your competition. You will get the easiest punchout integration ever! 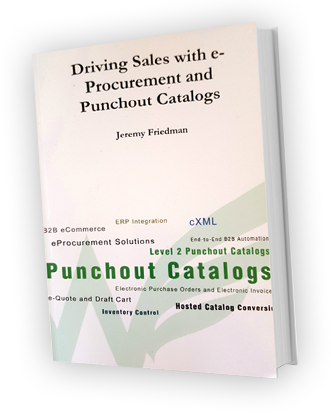 A punchout catalog is an eCommerce website that allows an institutional buyer to buy from a supplier directly from their electronic procurement system. Institutional buyers such as universities, corporations and hospitals purchase procurement software to control their financial spending. By allowing their buyers to connect to their procurement applications via Punchout Catalogs they allow the individual buyers (ex. : a facilities manager ordering soap for restrooms, a lab technician ordering beakers) to place requests for items, but put the approval process with management. Suppliers still deal directly with the same end user, but very often orders are faster and more accurate. Many procurement applications also use catalog interchange format (CIF) catalogs, which are less flexible than full punchout catalogs. The core of Punchout catalog communication is a universal standard called Commerce Extensible Markup Language or cXML. cXML and the Punchout mechanism was developed by the cxml.org industry group. cXML is a standardized language that allows electronic transactions to be completed in a quick and efficient standard. When a user enters your Punchout catalog credentials are sent to authenticate the user. These credentials uniquely identify the buyer and individual logged into the catalog. After reaching your punchout catalog the buyer can shop and add items to their shopping cart. When they are ready to check out, they simply click the checkout button and their shopping cart is transferred back to the procurement application. What can a Punchout Catalog do for your business? By maintaining your own catalog you can eliminate the need for updating hosted catalogs across numerous buyers. All of your buyers simply connect to your Punchout catalog and get their specific pricing information. Because your punchout catalog is maintained at your location, the pricing information, shipping discounts and product availability can be controlled and stay up to date. If you discontinue a product you can remove it instantly instead of waiting for a product update on the buyer side which could take days. By using Punchout your buyer may offer you the ability to accept purchase orders and submit invoices electronically. This allows buyers to have accurate POs and invoices, but generally you as the supplier get paid faster. Some of our clients have seen receivable terms go from 60 day payment terms to 3 day payment terms via EFT. A punchout catalog allows you to control the look and feel of the user shopping experience. Instead of a grid layout like a hosted catalog, a Punchout can look exactly like your existing website, giving users a familiar look they have become accustomed to. Our clients that have become punchout enabled have found that not only do they get paid faster, maintain control over inventory, but they also retain more customers. By offering the flexibility of a punchout catalog, your buyer is less likely to search out your competition. If a punchout catalog seems right for your organization contact us at 1-877-415-3237 or use the form below. Ready to get started? Contact GreenWing Technology to set up a demo. After reviewing eight other punchout suppliers, we decided to partner with Greenwing Technology, because they took the time to fully understand our multitude of requirements. They were able to clearly explain, and even recommend, the solutions needed to address each of our challenges, end-to-end. Jeremy Friedman and his team have been responsive since day one, and Greenwing continues to be our trusted partner for all our punchout needs. Their developers are US-based, and have met all of our requirements on time and within budget. We are privileged to work with the outstanding team at Greenwing! Jeremy and his team at Greenwing came to our rescue when we were on a tight deadline for a customer project. They were able to meet our needs with a fully functional punchout site in less than a month! Their support has been great and they’ve made it easy for us to operate our site autonomously while still being able to rely on them when big questions come up. Great team to work with. As a small company with limited back-end e-procurement knowledge, it was a blessing to have Jeremy and the team at Greenwing represent Fidelity as we integrated our portal with a major corporation. Working with Greenwing, our project was completed in a professional and timely manner and we came off looking like a pro.